A new report has said that adding at elevator to the middle of a busy Vancouver bridge access could improve access to the island below. The report's suggestion of the addition of an elevator to Granville Street Bridge is put forward in a report on measures to revitalise the Granville Island. The strategy aims to increase the number of visitors to the Island, while shifting the primary mode of travel from private automobiles to to transit, bicycle, ferry and foot. Currently, Granville Island is poorly served by transit, with the one bus route running relatively infrequently every 15 minutes. "Yet, directly above Granville Island, a city bus passes every two minutes along the Granville Street Bridge," says the report. 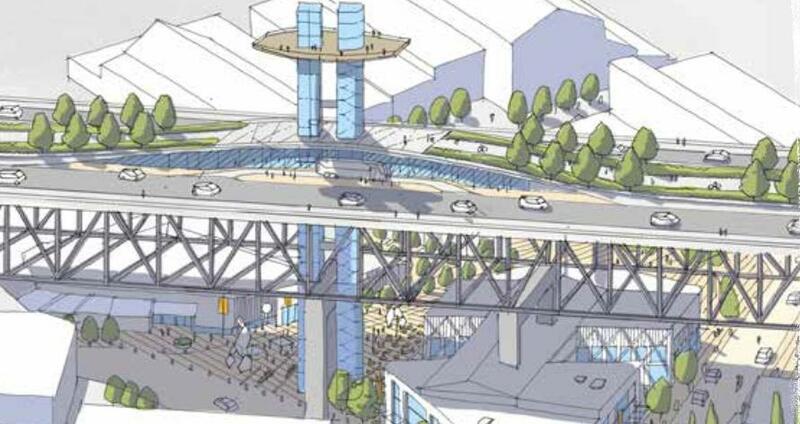 "The proposed solution to this challenge is to provide an elevator (and a staircase) that would connect Granville Island to a new bus stop on the Granville Street Bridge." Design concepts could also include a tower feature that would offer access to a viewing platform above the bridge. Other proposals include a pedestrian and cycle bridge to the island.